Create a water feature in your garden. A pond, ideally without fish, will enable amphibians and dragonflies to breed. If a pond is not practical, a simple bird bath or pebble fountain will provide a place for animals to drink. 6000 gallon Koi pond, a stainless steel pergola water feature and a complete garden construction! We were again fortunate enough to secure the complete garden refurbishment works to this handsomely set detached house in the wealthy climbs of Totteridge, North London. An exciting project to do, there were sixteen different major tasks to undertake, some ran concurrently and others in order. We needed to be organized and proactive, as to ensure the process went smoothly causing the least amount of disruption to the homeowners. 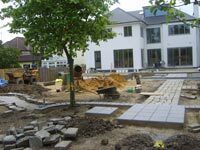 Spanning from the complete undoing of a very established garden, to the introduction and leveling of a hundred and twenty tonnes of top soil, to the preparation and installation of 150 sq metres of paving, 90 metres fencing and 100 sq metres of new lawn. This project really pulled from all areas of our skill base. 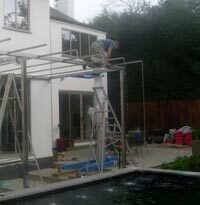 And most excitingly the manufacture and installation of a glorious stainless steel pergola (that allows water to return to the pond via the chains!) and a six thousand gallon koi pond.